The Four Seasons Langkawi, designed by Thai architect Lek Bunnag, is one of the most exquisite havens on this Malaysian resort island. This Arabic-Indian-Moorish-inspired beachfront resort in a Malaysian kampong setting comprises 91 guestrooms and 20 spectacular beachfront palatial suites featuring double-height ceilings and private plunge pools. 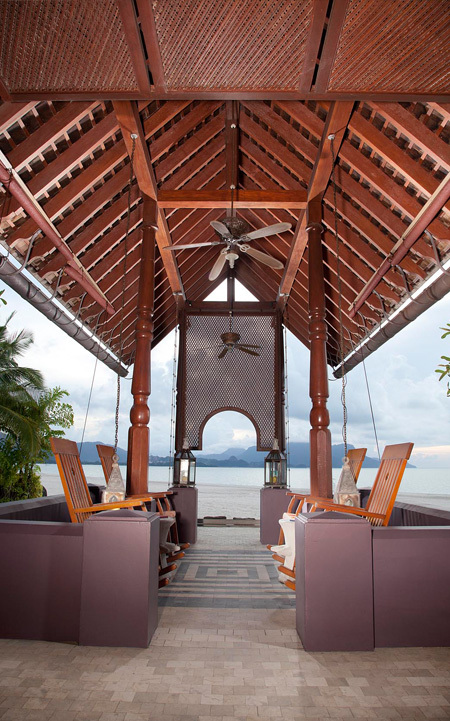 The structure featured here is the Rhu Bar, a freestanding West-facing pavilion with a cruciform plan located on the resort’s own strip of private beach. An oversized swing fixed in one external wing of the Rhu Bar adds a nice touch for a romantic sundowner. A timber latticed screen suspended from a horizontal beam is an elegant shade against the glare of the tropical sun and when viewed from the inside out, frames the seascape nicely with its simple but classy arc. 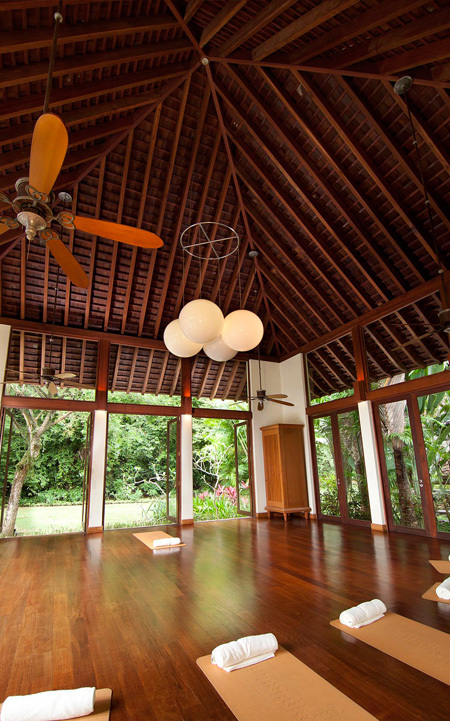 The shingled roof on exposed timber trusses and battens is supported by round timber columns on masonry stumps. Inside, the central space is characterized by a system of trusses forming an inverted pyramid which adds drama to the central space. From this dramatic core, other spaces emerge and are partitioned by a series of delicate timber screens with intricate carvings, providing a semi-private space for several alcoves set for two. At the Rhu Bar, the internal timber screens hint of an Arabic influence, particularly with its mihrab-shaped doorways. Mood illumination is provided by inverted cones of pendant lights which, although a strong design feature in itself, do not overwhelm the bar’s overall design.